The meeting between The Congress and TDP chiefs on Thursday likely to focus on seat-sharing formula for Telangana polls. Telugu Desam Party chief and Andhra Pradesh Chief Minister N Chandrababu Naidu held talks with National Conference president Farooq Abdullah and NCP chief Sharad Pawar in New Delhi on Thursday to discuss the plans for the future of the nation and he will be holding talks with Congress president Rahul Gandhi later in the day. Speaking to mediapersons, Chandrababu Naidu described the objective of the meeting was to discuss the bad phase the nation was going through. “We have discussed and decided to have a meeting for chalking out an action plan to save the future of the nation,” he said. Naidu said he was asked by the other two senior leaders to meet other non-BJP political party leaders and there will be a meeting with all those leaders in New Delhi shortly. 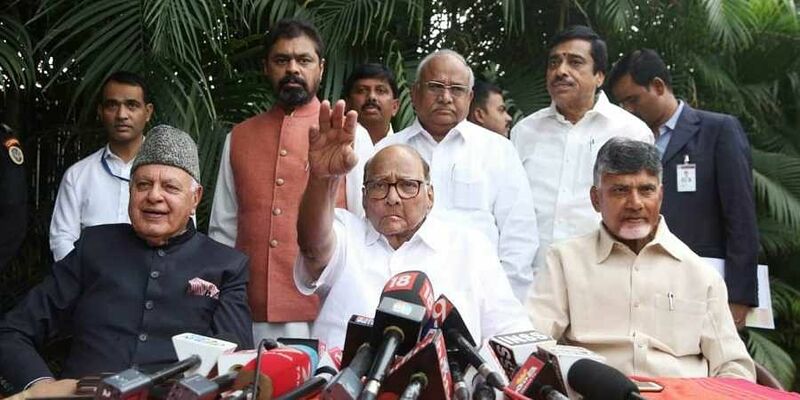 NCP chief Sharad Pawar said the situation in the country is deteriorating day by day and attacks on institutions like CBI, ED, and RBI are a cause of concern. Though, Chandrababu Naidu said they have not met discuss power, seats, but only in the interest of the state, the developments in the Nation’s capital on the political front, give a different picture. It was TDP chief’s second visit to New Delhi in less than a week and significant changes in the political scene are expected at the national level after his meeting with Rahul Gandhi, which will be first such meeting. Both the leaders had shared dais during the swearing-in ceremony of HD Kumaraswamy as Chief Minister of Karnataka.